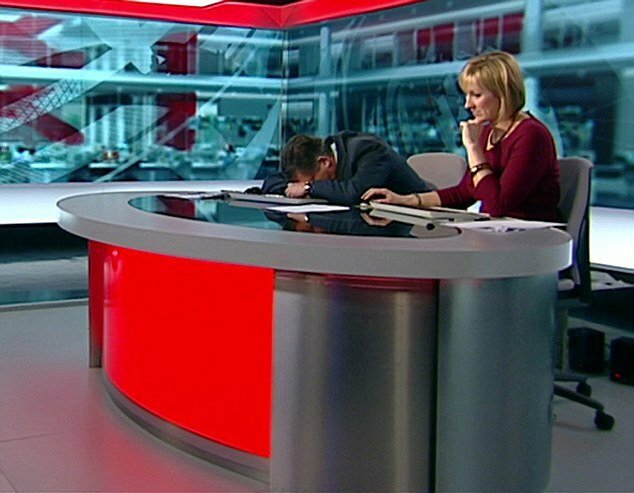 Simon McCoy, the BBC Breakfast show presenter, has been caught apparently asleep on his desk during this morning show. Simon McCoy, 50, looked like he was caught napping as cameras panned to the presenter ahead of his early broadcast – a claim he later joked about. He was seen clearly resting his head on his arms as he slumped over his desk moments before delivering a bulletin with co-host Martine Croxall. As soon as Simon McCoy realized he was live on television, he looked stunned and bleary-eyed as he jumped up and tried to regain his composure. But viewers took to Twitter to remark on the hilarious gaffe just before 8:30 a.m.
BBC officials said the journalist was “caught unawares” as the cameras moved from the studio where regular sofa presenters Louise Minchin and Charlie Stayt had been quizzing guests. It is not the first time Simon McCoy has caused amusement on his live broadcasts. Two years ago the BBC also apologized after weatherman Tomasz Schafernaker was caught making a rude gesture to Simon McCoy live on air on the BBC News channel. Tomasz Schafernaker raised his middle finger to the presenter, not realizing he was still on air. On a YouTube clip in August 2009 he is shown acting wildly and banging on his desk during a piece on stock market news. A month earlier the prankster was held up mid-air over his desk by a floor manager as he copies a fitness instructor showing Bill Turnbull and Kate Silverton how to do a push-up. His comment prompted a flurry of what appeared to be in-jokes about his recent royal coverage. The blooper came in the same week that Fox News presenter Doug Luzader fell asleep during a broadcast on the Republican presidential candidate Super Tuesday race in the US. The hilarious gaffe shows the journalist with his head slumped on his chest as the studio news anchor tries without success to wake him.